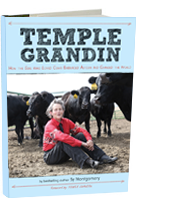 In this compelling biography, the author Sy Montgomery takes us inside Temple Grandin’s extraordinary mind and opens the door to a broader understanding of autism. Every day at school, she dreaded the sound: the loud, deep ring of the old-fashioned school bell. The janitor rang it at the end of each class: CLANG! CLANG! CLANG! Most kids were happy to hear it—but for Temple Grandin, the ring of the bell hurt like a dentist’s drill hitting a nerve. She covered her ears, but she could still hear it. There was no escape.